Charlie Waller (Born Charles Otis Waller, January 19, 1935 - August 18, 2004) was the lead singer and guitarist for the legendary bluegrass band the Country Gentlemen. Waller was involved with the Country Gentlemen for 47 years. As a member of the Country Gentlemen, Waller was inducted into the International Bluegrass Music Hall of Honor in 1996. Biography, Waller was born in Jointerville, Texas and moved to Lake Charles, Louisiana at the age of 2 with his family. He began to play guitar at the age of 10 and moved with his mother to Baltimore, Maryland. 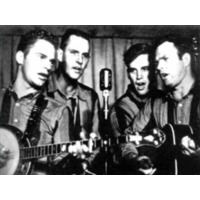 In 1952 Waller joined Earl Taylor's bluegrass band, the Stoney Mountain Boys. He returned to Louisiana in 1956 as a guitar player with Buzz Busby and the Bayou Boys, making appearances on television. In 1957 he and Busby returned to the Washington, D.C. area, where Waller met mandolinist John Duffey and banjo player Bill Emerson. When Busby was injured in an auto accident in July 1957, Emerson formed a temporary band with Waller and Duffey to fulfill Busby's bookings. The temporary band soon became permanent, and The Country Gentlemen would continue for more than fifty years. The Country Gentlemen achieved fame across the United States and internationally. While more than 100 musicians have been members at one time, Waller was an original member of the group and has many famous songs to his credit. The band released a new album, Songs of the American Spirit, in September 2004. On August 18, 2004 Charlie Waller suffered a massive heart attack at his Gordonsville, Virginia home. A month before his death Charlie Waller told his bus driver, Kenny Wurzburger, that he had a pain in his liver. An autopsy would reveal that Charlie was in the early stages of liver cancer at the time of his death.